National Interest, Domineering or Just Hypocrisy? There was important but least reported news about letting the Syrian local insurgents out of RAQQA. Ex-President of Afghanistan, Hamid Karzai revealed that IS fighters are present in Afghanistan and being supplied ammunition by the Coalition’s unmarked Helicopters. It, however, fell on deaf ears for people were at a loss to connect the two stories. 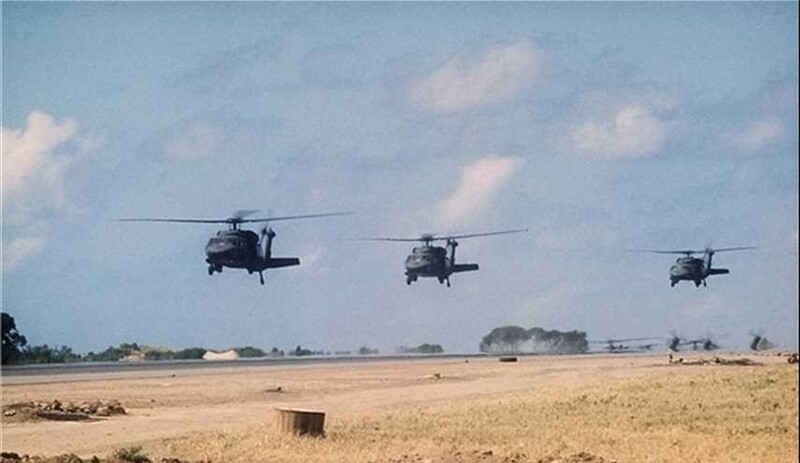 (Ahlul-Bayt News Agency) – A senior Afghan legislator revealed that the US helicopters have transferred a large number of ISIS terrorists to the province of Nangarhar in the Eastern parts of the country. Last week, the US military helicopters transferred over 50 ISIS fighters to Barabad region of the town of Behsoud in Nangarhar province, Zahir Qadir said. He also disclosed that a container full of military equipment was also delivered to the ISIS terrorists in Nari Obeh region of Nangarhar province. Syrian authorities have caught US military aircraft secretly transporting ISIS terrorists out of Syria to unknown destinations. According to senior Syrian legislator Ammar al-Assad, the United States is helping ISIS to escape Raqqa, where Russian and Syrian forces are successfully defeating the terrorist organization. Farsnews.com reports: Assad said that the US is now transferring the ISIL terrorists from Syria, especially Raqqa province, to unknown places. Raqqa was turned into rubble due to constant bombing by the Syrian, Russian and coalition forces and almost all of the three hundred thousand residents were forced to move out. The only ones left were well dug in Islamic State fighters. Islamic State’s presence was beneficial to Basher Al Assad for decimating any of his opponents labeling them as IS fighters. It was pivotal for the Russian involvement in support of Syria. West’s involvement in the Middle East was also legitimized by the presence of IS. Moreover, it was fighting the Syrian army and Hezbollah fighters, the main targets of the Western forces. IS fighters as per the agreement reached were transported out of their stronghold Raqqa for three days and nights; on private buses and trucks, for ultimate destination Afghanistan. Basher Al Assad; an underdog, now the winner, holds 50 % or more of the Syrian land—12 out of 14 Governorates– as compared to 19 % before. He is acquiesced to continue as president of Syria and his removal has been shelved for good. Russia perpetuated her role in the Middle East in particular and the world in general. President Donald Trump, during his recent trip, concurred with President Putin on a negotiated settlement of Syrian conflict, rather than the Military solution. What a capitulation to the Russian maneuvering! Unfortunately, however, it is the Syrian civilians who got trampled in this fight of the elephants. In 2016, from an estimated pre-war population of 22 million, the United Nations (UN) identified 13.5 million Syrians requiring humanitarian assistance, of which more than 6 million are internally displaced within Syria, and around 5 million are refugees outside of Syria. They were forced to abandon their homes and take refuge in neighboring countries, Europe and Turkey. More than five hundred thousands innocent civilians got killed. (American Trade Tower attack (9/11), 3000-innocent killed, was avenged by destroying two un-related countries. 500k innocent killed then, by this very yardstick, would need 166.6 countries to avenge!). This entry was posted on December 26, 2017 at 7:22 pm and is filed under Blogroll, Current events., Interpersonal Relationship, Middle East, Muslim Dominated Countries, Muslim World, POLITICS, Uncategorized. You can follow any responses to this entry through the RSS 2.0 feed. You can leave a response, or trackback from your own site.